I had about an hour for lunch with the LRP (Lovely Romanian Princess), and Pop Burger was close and convenient. It was about noon, and the place was relatively quiet. We ordered some ridiculously over-priced burgers (over $40 for two lunches) at the window, and we waited about 7 minutes for our orders to come up. I ordered the POP Burgers, and LRP went with a veggie burger. The Beef: Yawn. I discovered, much to my bemusement, that Pop Burger served mini-burgers. 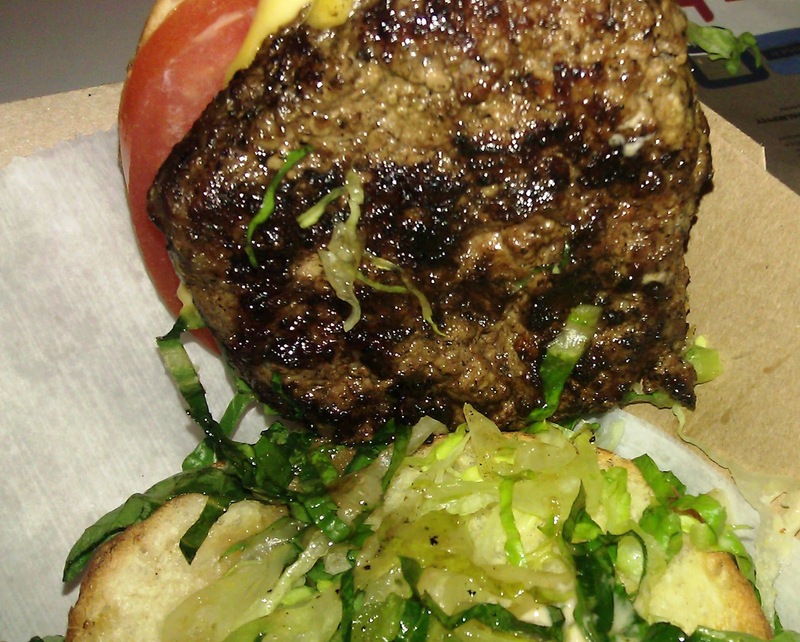 The patties could not have weighed in at more than 2 ounces each. The beef was mild, bland, and only moderately beefy. As for the cuts of beef in the grind...I guessed it was Chuck. The burgers were basically devoid of character. The beef was a little on the chewy side. It was neither greasy nor juicy. The beef was dull. The Seasoning: I detected a faint hint of salt on the exterior of the wee patties, but it was not enough to improve the bland burgers. The Sear: Pop Burger valiantly attempted to sear the waifish burger patties, but a proper sear would have dried out the patties even further. The Preparation: Well Done was the only way to get a burger this small. The burgers were so small that each amounted to 2 bites. The beef was ground at a medium setting. I honestly gave up on these tiny pucks of Chuck. They were so uninteresting that analyzing them was nearly pointless. The Cheese: Pop Burger provided a mini slice of American cheese to top the teensy burger patties. The cheese was fine, but the burger was just dull. The cheese could not save this lifeless burger. The Meat To Bun Ratio: The dryish brioche slightly outpaced the dryish burger patty. 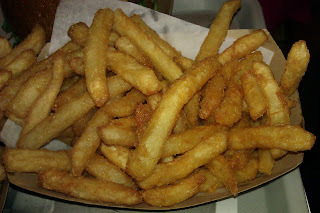 The Fries: The battered and par-cooked fries at Pop Burger were FAR better than the glorified amuse bouche burgers. The portion was not laughable, and the quality was fine. The fries were golden, crisp, nicely salted, and the crunch of the batter served to balance the creaminess of the centers. The Toppings: The tomato slices were ripe and flavorful, but the shredded Romaine lettuce was watery. The lettuce served to make a dull burger even more dull. The Veggie Burger: Woof--this was a $10 breaded and deep-fried slice of portabella mushroom. It was rubbery and greasy. Pass. The Value: For $9.25, Pop Burger served up 2 miniscule burgers. Each was about 2 bites. When I surveyed my lunch, my initial thought was, "Are you kidding me?" They were not. A side of fries was $4.25, and that was well over-priced for potatoes, but at least there were more than 4 bites of fries. The value at Pop Burger...it wallowed in weakness. I was grateful for the company of the LRP, because Pop Burger was a bust, otherwise. 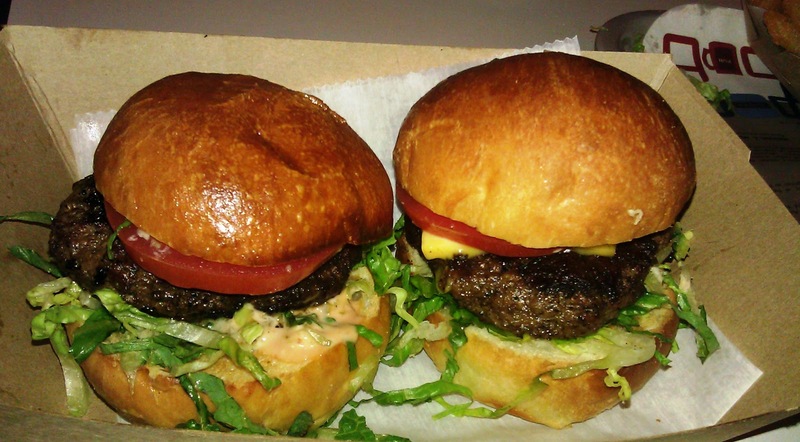 Burger Review : Pop Burger served up bland and tiny burgers for an exceedingly high price. Don't!